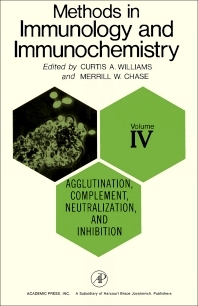 Methods in Immunology and Immunochemistry, Volume IV: Agglutination, Complement, Neutralization, and Inhibition provides information pertinent to direct and indirect agglutination reactions. This book covers a variety of topics, including complement-fixation procedures, isolation of complement components, hemolytic intermediates, complement-related proteins, and neutralization reactions. Organized into three chapters, this volume begins with an overview of test-tube agglutinations that are preferred for blood grouping with saline agglutinins that require more than a few minutes for agglutination. This text then describes blood group antibodies that agglutinate red blood cells suspended in saline. Other chapters consider the classical pathway of complement utilization. This book discusses as well the complexity of events leading to hemolysis of erythrocytes by complement. The final chapter deals with the ability of antitoxin to neutralize diphtheria toxin and explains the quantitative relationships between antigen and antibody. This book is a valuable resource for immunologists, scientists, and research workers.